Rainwater can enter the sewer system during rain events and cause a mixture of sewage and rainwater to flow untreated into our waterways. To prevent this from happening, the Portland CSO project is part of a grand plan set in motion by the Louisville and Jefferson County Metropolitan Sewer District to reduce flooding. A covered underground Portland Storage Basin will offer the Ohio River protection from sewer overflows. The combined sewer overflow system would be capable of alleviating pressure of the cities’ sewer systems to ensure that residential areas don’t experience flooding when rivers run high. The Portland CSO, located in the Portland neighborhood of Louisville, will collect overflow storm water from the Ohio River and gradually reintroduce the overflow water back into the sewer systems. It was necessary that the system could hold 6.7 million gallons of sewer overflow and had a 230-ft. inside diameter. To achieve these results, multiple lifts of one-sided wall pours were done. Due to the complexity, one lift a day was completed. Radial forms were used with the ability to roll back. 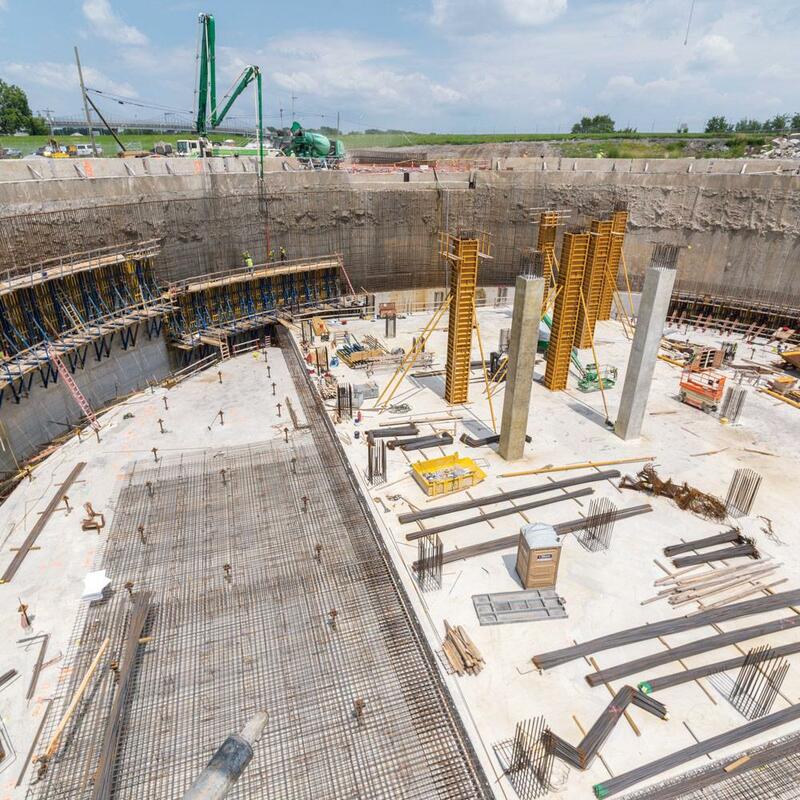 The contractor, Dugan & Meyers, chose Doka equipment because they felt Doka had the best product for the application. 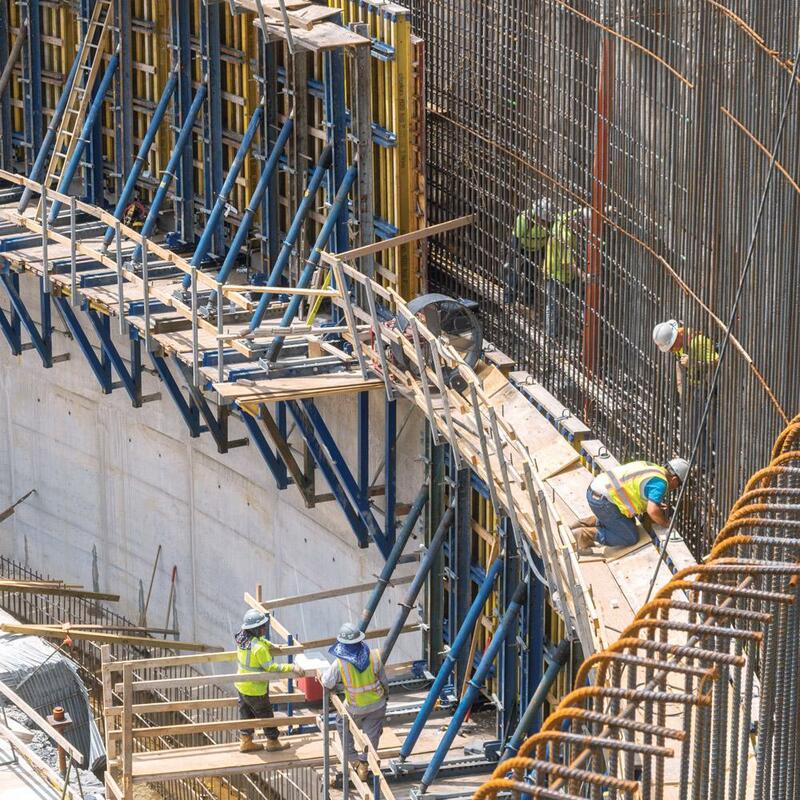 Doka’s tieless cantilevering system was desired, and Doka provided project insight and value engineering that made the choice not just about equipment selection, but rather about adding another partner to the job. On this project, one-sided walls, radial walls and multiple lifts were integral parts of the job. Doka provided Dugan & Meyers with Top-50 gangs which could be preassembled to the radius needed. D-22 Platforms could strip and cycle easily, as well as withstand the pour pressure of a one-sided pour. Thank you for your interest - Portland CSO. Thank you very much for your interest - Portland CSO.